ENGLEWOOD, Colo. (CelebrityAccess MediaWire) — The Museum of Outdoor Arts, the organization that runs Fiddler’s Green Amphitheatre has signed a deal with AEG Live Rocky Mountains that will see AEG providing programming for the venue. According to the Colorado Business Journal, The 15-year lease agreement will see AEG Live Rocky Mountains take over booking duties at the venue starting with the 2014 season. 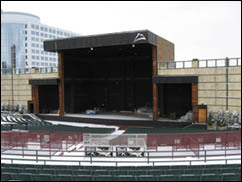 Fiddler's Green, which opened in 1989, has been booked by Live Nation Worldwide for the past several years. AEG Live also plans to spend at least $5 million on upgrading just about every aspect of the venue.